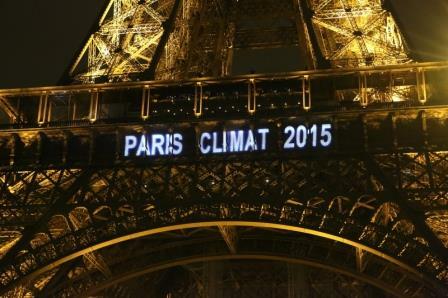 All eyes are on the upcoming climate talks in Paris. Set to begin November 30, the UN Climate Change Conference is widely viewed as the last chance for a substantive international agreement to head off runaway climate destabilization. It seems likely that a deal will be struck, but the real question is whether it will be enough to do the trick. Over the past several months, about 150 countries — including China, the United States, the European Union, and India — have made voluntary pledges to reduce their greenhouse gas emissions after 2020, when the deal is supposed to take effect. Negotiations in Paris will seek to build upon those commitments and create a structure to monitor and strengthen them. The major problem facing negotiators is that the commitments made so far are not sufficient to hold the world under 2 degrees C of warming. The general scientific consensus is that anything over 2 degrees C runs the risk of triggering dangerous changes that could cause global havoc. This news comes as a flurry of new reports remind us that the road we are on currently will lead to disaster and that changes already underway will have terrible consequences, especially for the world’s most vulnerable populations, the poor, young, old, and sick, to say nothing of other nonhuman species, many of which are vital to the health of the world’s ecosystems. A study issued just days ago by the National Academy of Sciences, for example, warned that greenhouse gas emissions will cause a dramatic collapse of the ocean’s marine life unless we reverse course. A massive coral bleaching event that is sweeping across oceans from Hawaii to India to the Caribbean is among several developments underscoring the report’s findings. Another recently published analysis estimates that, given carbon emissions to date, the world has probably committed to at least 1.6 meters of long-term sea-level rise, more than five feet. This level of locked-in increase will submerge most of the homes in over 400 U.S. towns and cities, including New Orleans and Miami. Among cities tbat will experience similar fates if they do not take drastic action soon are New York City, Philadelphia, and Jacksonville. The rapid drop in the cost of producing wind and solar energy is certainly among the most hopeful developments. As a result, the International Energy Agency earlier this month projected that by 2020, 26 percent of the world’s energy will be generated by renewable sources. That’s definitely good news. The talks in Paris will make it clear whether we can avoid pushing the temperature up another 1 degree C. If not, the road from Paris will be much more difficult than anything we have had to deal with on the road to Paris. Let’s hope that our leaders recognize this and act accordingly.